Many couples dream for years about how their wedding will be one day. I know that I certainly have and have a perfectly tailored Pinterest board to prove it! With that being said, a girl can dream, but the chances of my future wedding turning into my dream wedding seem pretty slim. 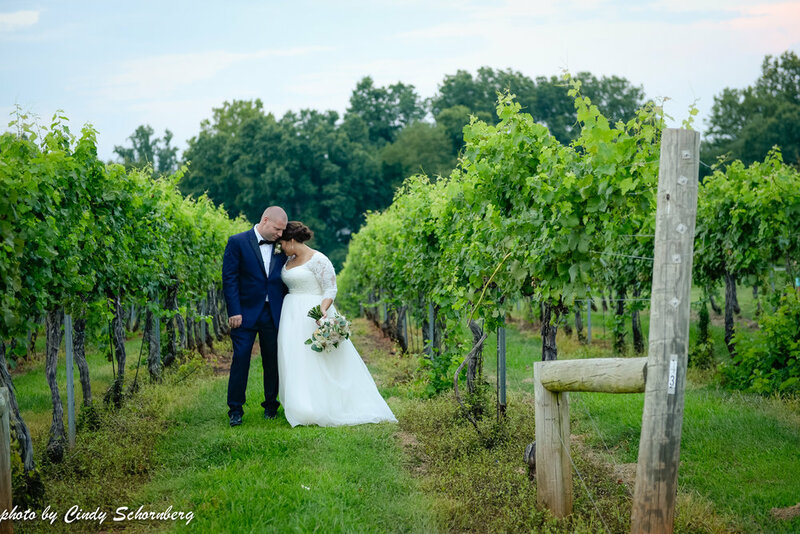 Lauren and Scotty’s wedding on August 11, 2018 at Keswick Vineyards was, in essence, a fairytale wedding and I’m sure that the way that they envisioned their wedding was brought to life. In other words, their wedding was picture-perfect! Lauren looked absolutely stunning in her, not one, but two wedding dresses of the day! The first was so elegant and reminded me of something only a royal would wear. In the cream-colored off-the-shoulder dress that was adorned with lace flowers and her cathedral-length veil, she could not have looked more put-together. Her second dress of the day was all white with lacing over the top of the dress. She looked absolutely divine in her “evening gown.” If her outfits changes don’t scream “princess,” I don’t know what does! What is a princess without her royal court, though? Lauren had five cute flower girls that alerted the crowd to get ready for Lauren’s entrance. The large group of children reminded us of something that you would only see in a royal wedding! Not only were there flower girls, though, there were also three rings bearers, or should I say, “ring security.” They made quite the entrance when the officiant asked where the ring bearers were. In their sunglasses and briefcases, they trotted down the aisle to the quartet of strings playing “Mission Impossible.” The guests were laughing so hard—it was quite the entrance! Not only was the ceremony full of energy because of the entrances of the flower girls, ring bearers, and of course, Lauren, but Maggie Smith-Kuhn painted the ceremony right as it was happening! Guests “oooh-ed” and “ahhh-ed” at how incredible the painting was and how it really captured Lauren and her “prince-charming” as they exited their ceremony. 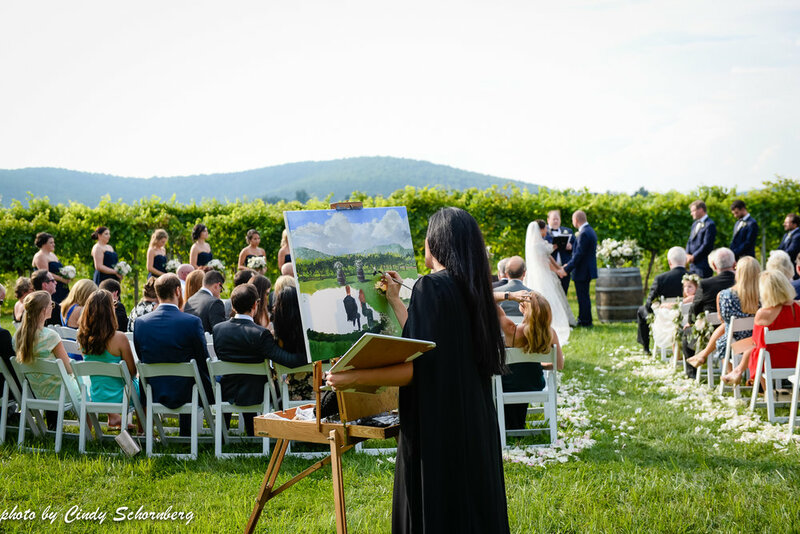 We thought that the painting was a great way to capture this special moment that the couple would remember for days and days to come. The magic didn’t stop at the ceremony, though! With the glowing chandelier that was placed directly over the dance floor, Lauren and Scotty commenced the night by partaking in their first dance as “Mr.” and “Mrs.” Guests were also able to enjoy their four-tier cake adorned with roses along the side as the night came to an end. Like any fairytale wedding, Lauren and Scotty, of course, departed in their magical carriage (or for us simple folk, what is known as a 1950 Bentley). As guests lined up for the sparkler departure leading up to Lauren and Scotty’s carriage, goodbyes and cheers were heard as the couple left for their trip to Bali. The night was absolutely magical, to say the least. Congratulations, Lauren and Scotty! We hope that the rest of your lives are as “magical” as this night was! 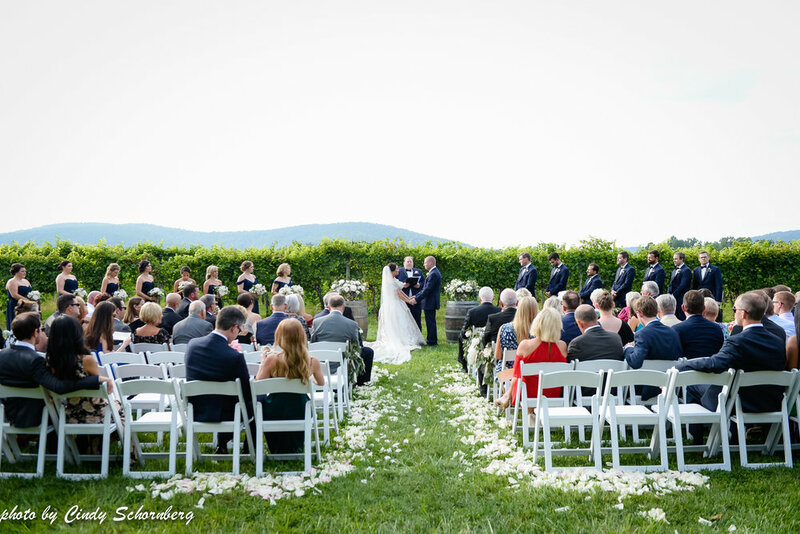 Event Planner: Keswick Vineyards, Caterer: C & O, Photographer: Rebecca Keeling, Florist: The Proper Petal, Officiant: Russel Dalferes, Cake: Cakes by Rachel, DJ: Derek Tobler, Musicians: Plum Blossom String Quartet, Painter: Maggie Smith Kuhn, Hair and Makeup Artist: J.S. Bridal, Transportation: Easy Riders Bus Company & First Class Limo, Lighting: Skyline Tent Company.